A master thesis by Dragana Radovanovi? under the supervision of Leif Edvinsson. 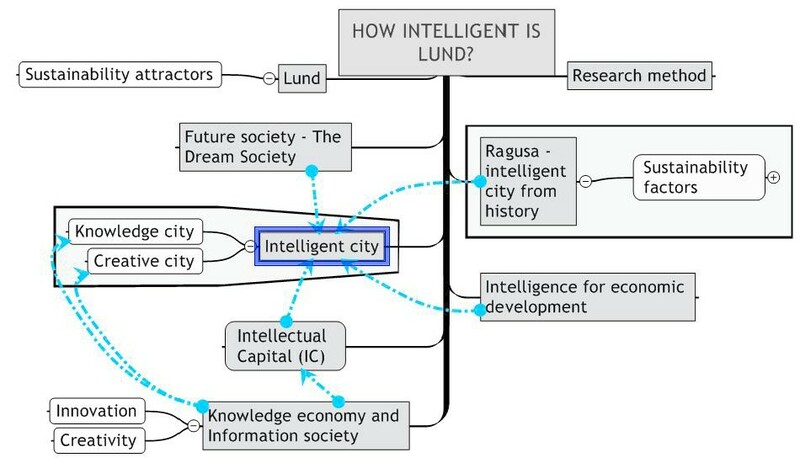 The purpose of the work is to identify factors associated with the Ragusa�s survival persistence and subject awareness, in order to highlight what the city of Lund may learn from this intelligent city. The 2005 edition of World Knowledge Competitiveness Index (WKCI) is published today by Robert Huggins Associates. The WKCI conciders to be the only composite and relative measure of the knowledge economies of the world�s leading regions. The paper of Rhonda Roberts, University of Wollongong, Australia, �Issues in Modelling Innovation Intense Environments: The Importance of the Historical and Cultural Context� defines innovation intense environments as those special spaces which are purported to accelerate the rate of innovation and proliferation of new, high technology industries. Twelve leaders from four IT companies, seven American universities and the Kauffman Foundation have adopted a set of guiding principles to address how to approach open collaborative research between universities and the IT industry. The expectation is that the principles will promote and accelerate innovation, shortening the time it takes to move from concept to development. The network is the pervasive organizational image of the new millennium. This book examines one particular kind of network – the ‘knowledge network’ – whose primary mandate is to create and disseminate knowledge based on multidisciplinary research that is informed by problem-solving as well as theoretical agendas. The Alpha Summit Europe 2005 brought together world experts in each of the fields of technology, education, entrepreneurship and private equity in order to synthesize their combined experiences to help the European technopreneurship communities to realize their full potential.